Abstract: The Scott Marsh Cory Collection contains photographs, albums, clippings, correspondence, and other materials related to Scott Marsh Cory, one of 35 Syracuse University students killed in the bombing of Pan Am Flight 103. Born September 27, 1968, Scott Cory was from Old Lyme, Connecticut. He was a junior in Syracuse University's School of Management, and was studying abroad in London through the Division of International Programs Abroad (DIPA). Scott was survived by his parents, John and Doris Cory; and two brothers, John Jr. and James. Scott was described by his parents as having "an infectious exuberance for life...and irrepressible sense of humor, and brought joy to those around him." 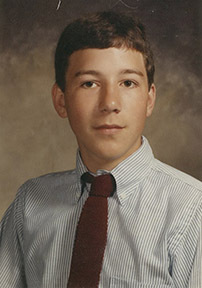 A memorial scholarship was established in Scott's name at Old Lyme High School. The Scott Marsh Cory Collection contains photographs, albums, clippings, correspondence, and other materials related to Scott Marsh Cory, one of 35 Syracuse University students killed in the bombing of Pan Am Flight 103. It is divided into two series: the Cory Donation, and the Habbe Donation. The former contains subseries for Clippings, Correspondence, Photographs, Subject Files, and Vital Records. The latter contains subseries of Clippings, Correspondence, and Subject Files. Materials in the Scott Marsh Cory collection were donated by John and Doris Cory, and Alan Habbe between 2007 and 2014. The Scott Marsh Cory Collection is fully processed. Materials donated in highly acidic binders have been removed, and rehoused in acid-free folders when possible. The collection is arranged in two main series: the Cory Donation, and the Habbe Donation. These series are further divided into subseries, as necessary.